Want to import music to a new iPhone? Do not keep on bothering your friends to share with you on online platforms. Today, how to import music to iPhone has been made easier. Irrespective of the operating system on your computer, there are applications to sort you. Here are simple and quick ways for you to follow. TunesMate is a product designed by iMyFone, which is a third-party software that enables transfer of filed including photos, video, and music between an iOS device and a computer. Apple’s iTunes came first and hit the market as an online music store. Its functionality and benefits cannot be questioned. While every time you sync music with iTunes, it has some limits or errors. Here is where iMyFone TunesMate comes in. 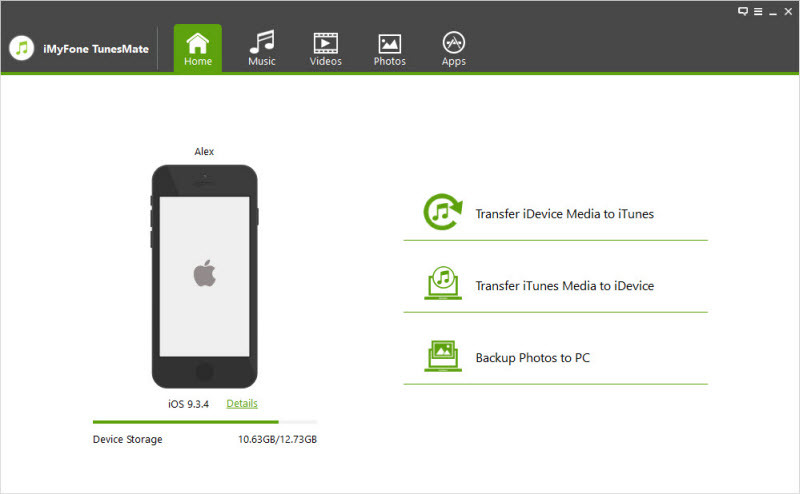 The software allows two-way transfer; from iPhone to PC and vice versa. iMyFone TunesMate has no limitation to connected number of devices. Thus, you can share videos, music, photos with your friends from both the computer and iPhone. It allows you to preview and select songs as per your liking. You are not constrained to massive transfers of albums and artists. Synchronization guarantees safety of your data. It functions as iTunes bypass. Here are the simple steps for how to import Music to iPhone using TunesMate. Connect your iDevice through a USB port and launch iMyFone TunesMate on the computer. On the top left of the software’s interface, click Music mode then select Add>Add File/Add Folder. Select target folder on your PC and choose the songs you want to import. A window will pop up to show the transfer is successful. It is important to note that iTunes only perform a one-way synchronization. This means, if you are successful in synchronizing and importing music to your phone, any other music files in the phone that are not on the computer will be automatically deleted. Be sure to back them up on email or with a friend’s phone if you value them highly to lose them. From the iTunes menu, select Music. Choose the song you want to transfer and drag it to your iPhone. If you cannot manually add songs to your iPhone, click on your device icon. Go to Summary, check "Manually manage music and videos" and Apply. To conclude, Using iTunes to sync music may erase previous data while syncing. TunesMate can selectively transfer music to your iphone easily with no data loss. So, just try TunesMate to make your music transfer without any hassel.